We all know how important it is to present our best possible self, unleashing the unmistakable feeling of illumination across all aspects of life, but did you know that the secret to putting your best face forward may actually be in your smile? Whether having a laugh with friends, showcasing ideas at a business meeting or embarking on a first date with that special someone – an illuminated smile can make you look and feel your best at all times. 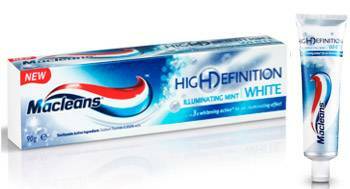 So light-up your day and ensure you're always presenting your best possible self with the new Macleans® High Definition™ White range, which helps illuminate your smile. 'The secret lies in the product's micro-fine ILLUMIPEARLS™ technology," says GSK Healthcare Expert, Montse Pena, 'which consists of alumina particles and silica, to gently lift stains and polish teeth from the first brush." This whitening toothpaste is available in two enticing flavours including Illuminating Mint with white, blue and aqua stripes for an uplifting freshness and Tingling Mint with white, blue and green stripes for an intense, tingling, fresh feeling. So next time you're doing something daunting like walking into a party alone, interviewing for your dream job or going on special date have the confidence to beam with Macleans® High Definition™ White.